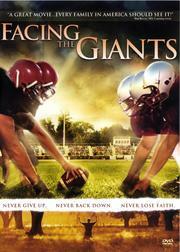 Facing the giants [videorecording (DVD)] / Sherwood Pictures ; produced by Alex Kendrick, Stephen Kendrick ; writers, Alex Kendrick, Stephen Kendrick ; directed by Alex Kendrick. James Blackwell, Bailey Cave, Shannen Fields, Tracy Goode, Alex Kendrick, Jim McBride, Jason McLeod, Mark Richt, Steve Williams, Chris Willis, Ray Wood. $c Statement of responsibility Sherwood Pictures ; produced by Alex Kendrick, Stephen Kendrick ; writers, Alex Kendrick, Stephen Kendrick ; directed by Alex Kendrick. 500 General Note $a General note Originally released as a motion picture in 2006. 506 RestrictionNote $a Terms governing access For private home use only. 508 ProductnCredits $a Creation/production credits Director of photography, Bob Scott ; editor, Alex Kendrick ; music, Alex Kendrick, Mark Willard. 511 ParticipantNote 1 $a Participant or performer note James Blackwell, Bailey Cave, Shannen Fields, Tracy Goode, Alex Kendrick, Jim McBride, Jason McLeod, Mark Richt, Steve Williams, Chris Willis, Ray Wood. 520 Summary $a Summary, etc. note A high school football coach with a history of losing games faces not only the pressures from a group of fathers wanting him fired, but also the possibility that his wife can never have children. When he turns to God, will his prayers be answered?. 521 Target Audience 8 $a Target audience note MPAA rating: PG; for some thematic elements. 538 Technical $a Technical details note DVD; region 1; widescreen (1.85:1) presentation; mastered in high definition. 546 Language Note $a Language note Closed-captioned; dialogue in English (5.1 Dolby Digital), Spanish (5.1 Dolby Digital), Portuguese (5.1 Dolby Digital), French (Dolby Surround) or Thai (Dolby Surround) with optional subtitles in English, Chinese, French, Portuguese, Spanish or Thai. 655 IT:Genre 0 $a Genre/form data or focus term Feature films. 655 IT:Genre 0 $a Genre/form data or focus term Melodrama, American. 655 IT:Genre 0 $a Genre/form data or focus term Religion in motion pictures. 655 IT:Genre 0 $a Genre/form data or focus term Sports films. 655 IT:Genre 0 $a Genre/form data or focus term Videodiscs. 655 IT:Genre 0 $a Genre/form data or focus term Videorecordings for the hearing impaired. 655 IT:Genre 7 $a Genre/form data or focus term Melodrama. $2 Source of term migfg. 700 AE:PersName 1 $a Personal name Blackwell, James. 700 AE:PersName 1 $a Personal name Cave, Bailey. 700 AE:PersName 1 $a Personal name Fields, Shannen. 700 AE:PersName 1 $a Personal name Goode, Tracy. 700 AE:PersName 1 $a Personal name Kendrick, Alex. 700 AE:PersName 1 $a Personal name Kendrick, Stephen. 700 AE:PersName 1 $a Personal name McBride, Jim. 700 AE:PersName 1 $a Personal name McLeod, Jason. 700 AE:PersName 1 $a Personal name Richt, Mark. 700 AE:PersName 1 $a Personal name Williams, Steve. 700 AE:PersName 1 $a Personal name Willis, Chris. 700 AE:PersName 1 $a Personal name Wood, Ray.